Is the I-75 service drive from Holbrook to Caniff a speed trap? A Channel 7 news report followed up on the issue that The Review first reported a couple of years ago. It took two years, but finally someone noticed. 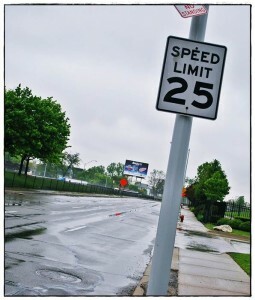 Back in 2009, The Review was the first to break a story that Hamtramck’s authority to enforce speeding laws was on shaky ground. The city had not, and has still not, performed traffic studies to determine what the traffic speeds should be – especially on the I-75 service drive where the speed limit is set at 25 miles per hour. Some have called that a speed trap. And now, WXYZ Channel 7 news investigator Scott Lewis has picked up Hamtramck’s “dirty little secret,” as we refer to it. Last Sunday, his six-minute report detailed how the I-75 speed limit could be illegal as well as dangerous, and how the city’s police officers’ union agreed to bring in at least $60,000 a month in traffic tickets in order to save their jobs. Lewis talked to a traffic expert with the state police who said that it’s unheard of to have a 25-miles-per-hour speed limit set for a service drive. The state police representative also said that setting a speed limit that low on a service drive can actually lead to accidents. Lewis also pointed out, which The Review also did two years ago, that according to state law, communities must first conduct traffic studies before setting speed limits. However, although it’s state law, there are no enforcement teeth in the law to punish communities that fail to comply. Back in 2009, City Manager Bill Cooper said there was no money to conduct traffic studies. But according to Lewis’ report, it only takes a couple of hours to study each street. Since most of Hamtramck’s streets are residential, there aren’t that many streets to study. Namely, what you have left, besides the service drive, are the main arteries: Jos. Campau, Caniff, Conant, Holbrook and Hamtramck Dr.
What has caught the most flak is having a 25-miles-per-hour speed limit on the I-75 service drive from Holbrook to Caniff – an area that is industrial. To make matters worse, that part of the service drive has a steep dip down under a viaduct, and when motorists start to come up the incline, that’s where a traffic cop is waiting. Lewis interviewed a number of motorists waiting to pay their ticket in Hamtramck 31st District Court. Some of them had spotless records for over 40 years. All of them said they were offered a deal where they could plead to a lesser offense, impeding traffic, and thus avoid points on their driving record, and subsequently avoid paying higher insurance premiums. The deal, however, results in a slightly more expensive fine, and – get this – the city shares less of the fine with the state. In others words, the deal means more money for the city. On top of this sweetheart deal, the cops have agreed – except in name – to a quota system by pledging to bring in at least $60,000 a month in traffic fines. City officials openly talked about the deal during budget meetings in 2009. But in an interview with Lewis, City Manager Cooper denied there was a specific dollar amount mentioned. He was quoted in this paper back in 2009 as saying the officers came up with the $60,000 a month figure to save their jobs. In 2009 about a dozen jobs were on the chopping block. According to city and court records, police officers have far exceeded that amount since a special traffic patrol program went into effect in 2009. According to those records, which were obtained by The Review through the city manager’s office, the cops brought in $1.7 million from November of 2009 until about last September, or about $80,000 a month. Local reaction to the report has been across the board. On Facebook, Mayor Karen Majewski defended the city’s speed limits, saying they are clearly posted that all one has to do is pay attention. Others say the city has speed traps. The National Motorists Association agrees. A couple of years ago, the NMA said the city had five speed traps, including the I-75 service drive. That dubious distinction is nothing new to Hamtramck. Back in the 1980s, the city had an aggressive traffic patrol program that raked in over $1 million a year in fines. That program was eventually dissolved under much controversy after it ended up costing Hamtramck property owners $8 million in a related lawsuit. Apparently, what is new is old in Hamtramck. Good for Channel 7’s Scott Lewis. I look forward to follow-up stories. The 25 MPH speed limit on the I-75 service drive is what’s criminal. Traffic laws are made for the public’s safety, not as revenue generators…how sick of Hamtramck to be doing this! apparently when police take initiative on finding illegal activities like drugs and theft they’re called heroes, but when they take initiative to focus on other illegal activities, especially ones that bring money into the city, they’re called predators! In my opinion if you are attacking our traffic program for doing a great job then either you support removing all traffic laws (hello anarchy) or support police losing their jobs so that they cant feed their families and defend us taxpayers. admittedly, i think the 25mph should be raised to 40 like many other service drives, but dont attack the whole traffic program.. I grew up on the service drive (Nagel) for 40 years until I moved out of Hamtramck 2004. If anyone didn’t live on Nagel back in the mid 70’s then no one would probably remember this. The police never use to sit on the service drive until the parents and neighbors petition city hall for there presence after Keith Plaskon, who was killed and his brother Chris Plaskon suffered a broken leg by a driver who was speeding down the street to beat the light. Keith’s body was dragged from Commor/Nagel 153 ft to just almost in front of his house. The driver took off. Then couple of years later Kurt Popov was hit by another driver who ran a red light also at Nagel/Commor. All of us were walking to and from school, We were all in the right of way walking on our green. I just wish the police was sitting on Nagel years earlier maybe my best friend would still be here today. To All the Officers who sit on Nagel keep up the good work. Maybe another child wont be kill or injured by someone who thinks the service drive is a Dragstrip. Roger Lamm, you are so far off base with your comment it’s amazing you got more than your own vote in the election. By saying that if you have a dissenting opinion on this matter then you either “support anarchy” or “support police losing their jobs” you are only discrediting yourself, not the valid arguments that have been made. You admit that you agree the speed limit should reflect that of those in the surrounding communities – which is largely what the issue was both when it was initially raised and now – yet in the same sentence you say don’t attack the whole program. The fact that there is a revenue-raising program with a specific monthly target was used to show a reason for not conducting the mandated study. A man that talks out of both sides of his mouth is truly talented and likely possesses many gifts. I can only imagine what part of the body is being used to generate ‘thought’.